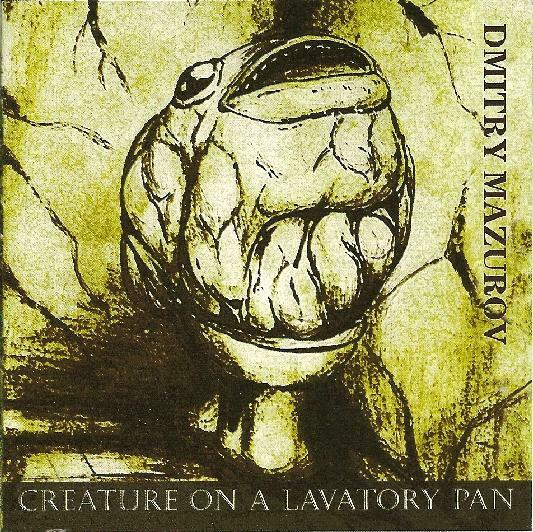 Dmitry Mazurov - "Creature On A Lavatory Pan"
Creature On A Lavatory Pan is Russian composer and musician Dmitry Mazurov's first album for the Electroshock label. All music on the CD is composed, arranged and performed by Mazurov, except for guests on guitar and violin on a few tracks. The album is an interesting mix of orchestrated pieces, space ambience and abstract sound experimentation. Some tracks focus on one of these styles while others bring them together with varying degrees of success. The more orchestral tracks pack an emotional punch. Luminous is a piano and orchestra piece that moves along at a gradual pace but tugs at the heartstrings. Reminiscences is similar, alternating between intensity and serenity, but at all times highly emotional. Lethargie is a light and very beautiful piece. And Sisters of Gloom is a lovely violin led melodic track that includes fun abstract sound experimentation. WIth Burevo we get into more experimental territory as Muzurov marries spacey soundscapes with light clattering sounds for the intro, but then transitions to howling static drones and radio signals and other electronics. Other highlights include Depths, which gets more abstract, with airplane sounding drones, static, and all manner of electronic sounds. It's all very sparse as Mazurov moves from sound to sound rather than layer them all together, but in the last minutes goes for the intense soundscape finale. Surovista is a very cool track that starts off with spaced out atmospherics that create a windswept landscape feel. The storm quickly recedes as Mazurov creates quietly bubbling electro sound patterns and atmospherics. Jury Starosotnikov is credited with electric guitar on this track, adding some really cool spaced out Hawkwind Space Ritual sounds. At 14+ minutes Mask for Delicate Aesthetes is the longest track of the set. It starts with cool electro rhythmic patterns backed by dark, quiet drones and soundscapes. The groove patterns shift around a bit and as the soundscapes move increasingly to the forefront the sounds become less rhythmic, though there is an interesting musical quality to the proceedings. Around the 8 minute mark it becomes completely musical, but accompanied by howling spacescapes and other sounds that make for an interesting contrast between conventional and abstract elements. And Awe is a similar blend of sounds and styles that provides much for the attentive listener to wrap his/her brain around. There's a lot happening on this album and while I sometimes wondered if Mazurov is cramming too many themes into single tracks, it is, nonetheless, an adventurous effort and provocative listen. And no review would be complete without mentioning Mazurov's cover art for the album. Creature On A Lavatory Pan depicts precisely that….. A huge mutant fish sitting on a toilet. It's comical for its absurdity, but the color and tenement like setting give it a disturbing quality as well. Pretty damn cool.